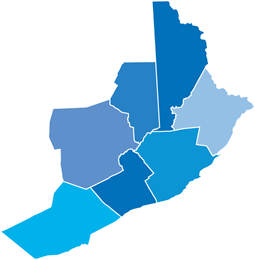 Wayne County is located in the northeast corner of Pennsylvania. It is almost exactly midway along the Boston-Washington Corridor. Major highway systems include Interstates 84 & 380, U.S. Route 6 and PA State Route 191. I-81 and New York Route 17 are located near Wayne County. This transportation network serving key Northeast metro markets facilitate distribution to a combined population of 50 million people within one-half day. This proximity to metro areas yet comparably lower costs of living and outstanding quality of life makes Wayne County one of the fastest growing counties in Pennsylvania. Its transportation network also includes rail service with access to the three principal Class 1 railroads operating in the eastern United States. Two private airports are located in Wayne County. Workforce development is a major priority in Wayne County. An Alliance has been built to identify, create and provide educational opportunities to build its workforce. Wayne County attracts a mix of small businesses because of its growing infrastructure, proximity to NY/NJ metro markets, cost advantages, and increased labor supply. Everyday business needs are met in a rural setting with outstanding natural beauty and enviable quality of life. Wayne County’s business base features strong tourism and construction industries, more agriculture than is found in neighboring Pocono counties, and an increase in businesses that serve a growing, creative and diverse community. Wayne County is also home to some well-known businesses such as Highlights for Children Magazine, Himalayan International Institute, and Cove Haven Resort.